The air flow control of EcoInCure leads to the best possible top coat appearance. The car body is heated up from the inside and experiences extremely even heating and cooling conditions. Consequently, on the outer body surface minimal flow velocities occur, and this greatly improves the appearance and distribution of the top coat and thus the surface quality. Leading paint suppliers have proven with their own research that paint curing with EcoInCure leads to less waves and greatly improves the quality. The principle of heating from the inside reaches massive car body components of the frame work, e.g. rocker panels, more directly than conventional systems. This leads to an optimum heat transfer from the hot air flow to the difficult to access parts/areas. As a benefit the required process time for heating up the body is reduced by up to 30 %. Electric vehicles need - among other things - well-reinforced rocker panels to protect the batteries in the event of a side impact. With EcoInCure drying these rocker panels with their increased material thickness works much better than in conventional ovens. Overheating of thinner parts of the body shell can be avoided. 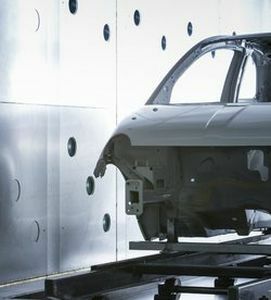 The same goes for future multi-substrate car body generations with new material combinations and new joining methods. Here, specifically, reduced thermal component stresses achieved by the new drying method EcoInCure ensure increased process reliability.